I have been reading a number of self-help business management articles recently. 2017 was a good year for vcleat.com but I want 2018 to be better. The articles were compelling and I highlighted many terms. I realized vcleat had problems that I didn’t know it had. For example, what was our corporate DNA? Our core competencies? I felt competent but was clearly missing named competencies. Other ideas in the articles resonated with me. I needed to empower the staff to give 110%. I needed ninjas as well as team-players. I wanted executional excellence. And to think outside the box. For 2018 I was ready to commit to do the heavy lifting needed to move the needle and take vcleat to the next level. But any changes to vcleat needed to be data driven and with sanity checks. Of course. In 2018 I also plan on selling a few pairs of vintage shoes. Usually I buy vintage shoes to wear or for my … uh … shoe museum. I will resell the shoes if they don’t fit me or I need to purge the collection to make extra space. Which is often. But occasionally I will buy a pair and resell them to make some extra money. And sometimes this plan actually works. 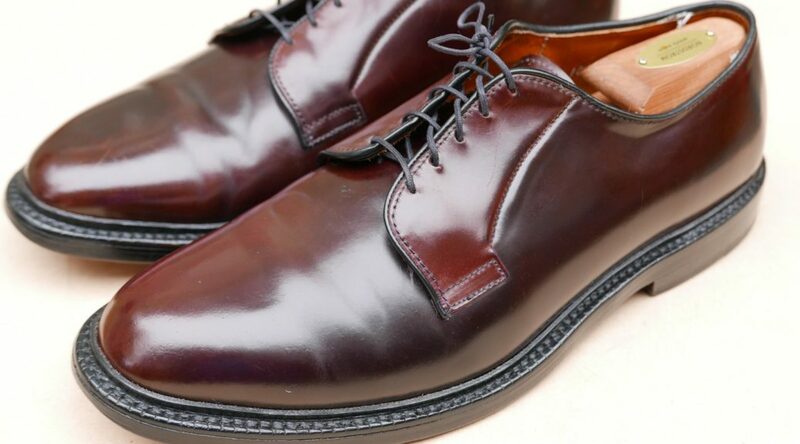 When buying shoes for resale I usually focus on Shell Cordovan shoes and/or Alden pairs. 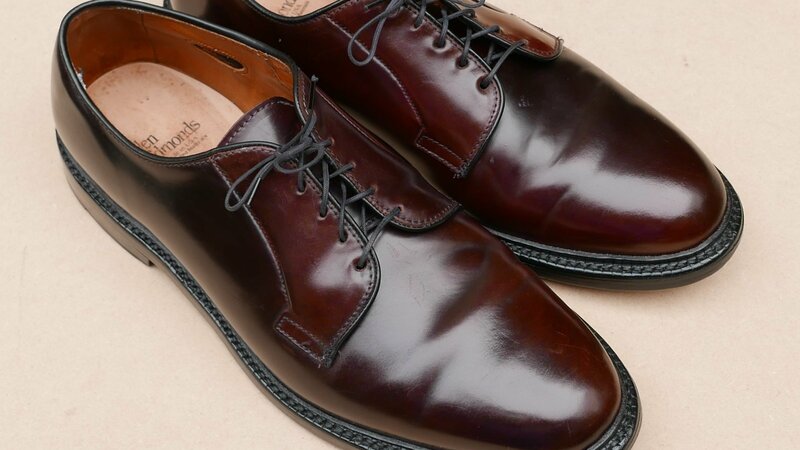 People pay a premium for Alden and Shell Cordovan shoes, often $200+. Anything else isn’t likely to make much money and so its probably not worth the time and effort. But finding low price Alden or Shell Cordovan shoes requires a bit of luck because they sell fast. New old stock (NOS) pairs are the best but lightly worn pairs are also desirable. NOS shoes generally sell for twice the amount of a lightly worn shoes. 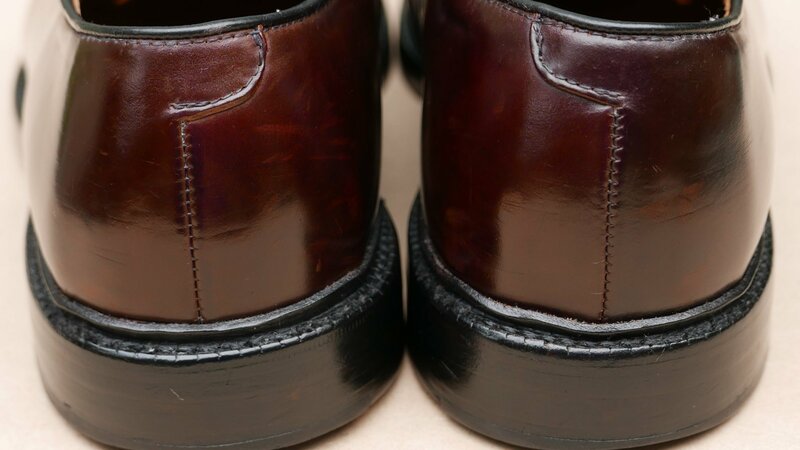 Low wear shoes can appear worse than they are due to lack of cleaning and maintenance. A wipe down and some polish can quickly restore them. It’s best to try to resell a common size. 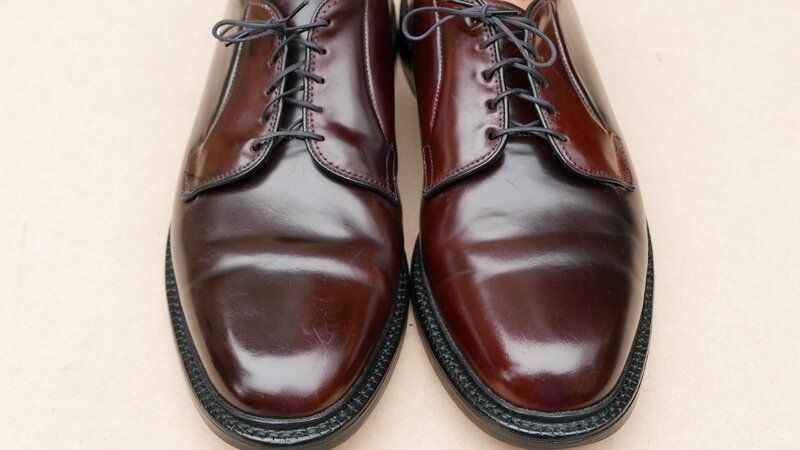 If you find a bargain Shell Cordovan pair in size 14 AAA, just realize there are very few people with that size. The most sought after sizes are 7.5 D to 12 D. There is more of a demand for wider sizes (E or EEE) than narrow sizes (A and AAA). When listing your pair, tag the pair with the correct brand and size in both the title and item specifics. Double check the accuracy of the information and check for any spelling errors. If the brand is misspelled, the shoes will get lost in Ebay. Take good photos if you want a good price. I factor in about one hour to create the listing. Both Ebay (10%) and Paypal (3.2%) take a chunk of any sale. Their fees cover not just the final price but also the shipping charge. This can eat up any perceived profit. For example, if you bought the pair for $60 total and then resold them for double ($120 including $15 shipping), you will pay fees totaling $16. Ouch. This leaves just $29 for your efforts. In a situation like this, it’s really Ebay who is making the profit (two commissions), and the Post Office (two packages). You just get pizza and beer money. 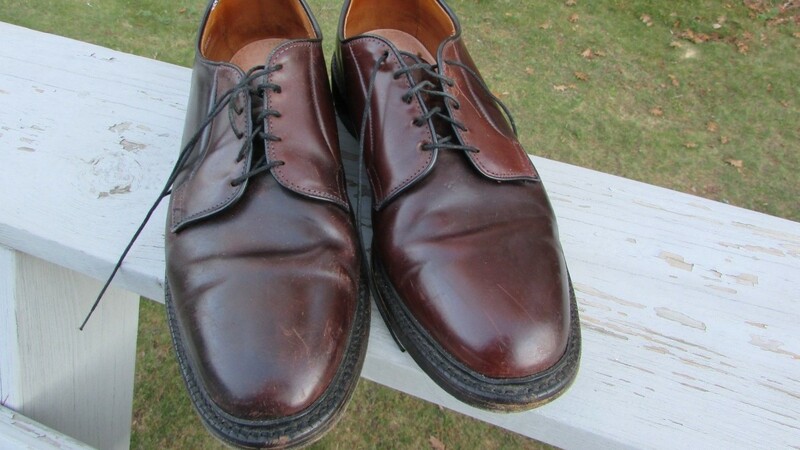 Below is a pair of Allen Edmonds Leeds that I bought and resold last fall. They weren’t listed as Shell Cordovan but it was obvious (to me) that they were. The upper was dry and scuffed but the shoes appeared to have limited wear. The seller was only charging $55 so I bought them. I listed the shoes for $195 and they sold in a couple days. Not too shabby. Reselling shoes won’t result in a liquidity event but it is possible to make a few bucks here and there. Plus if you like fixing up shoes (like I do), it gives you extra opportunity to work on your hobby. Good luck. Below are some photos of the cleaned and polished pair. Thanks. Interesting idea using sonicare on the welt. What cleaning agent do you use with it? Thanks. Nice shoes! I happen to be wearing my 93606s as I read this. Great, unfortunately I can’t buy shoes for resell on eBay, living in Europe would generate to high shipping cost, so there would even if I do a god buy, not leave any profit. 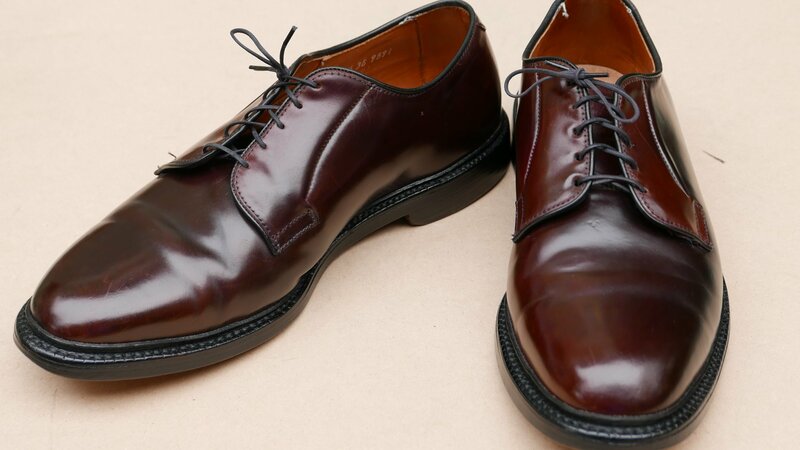 However I have purchased several times good shoes you featured on your list – and not only cordovan, I have become a fan of Canadian shoes, Hart, Dacks and John McHale.. (specially the last brand is difficult to find in my size). Something that surprises me, are the very high prices on new shoes (vintage shoes_) – are these for collection? Museum shoes? Or do people buy this for their wardrobe? I would never pay $900 or even $1200 for a Florsheim shoe.. I wouldn’t pay that much either. But sellers can charge what they want. I would be surprised if there are many buyers willing to speed $1000+ for a pair of vintage shoes. Here’s a cool calculator that gives you your profit based on purchase and selling price. According to the calculator the profit under the scenario you gave above would be $42. Thanks. I have the site bookmarked. sorry that is a bit of topic. 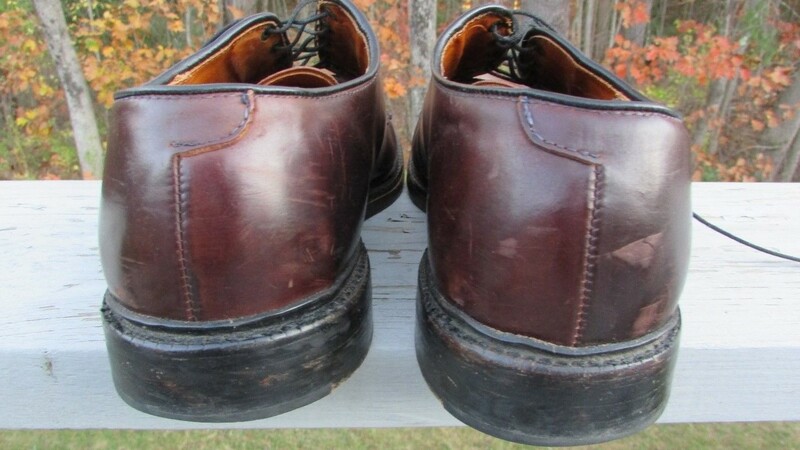 I purchased on eBay a pair of Allen Edmonds penny loafers “Randolph”. I suppose the model is a previous of the ones that are sold today, as inside the shoes the logo is printed differently. I am not sure if mine are shell cordovan or not, now I am wondering, how I could find out. The marks resemble rather to Cordovan than to calf skin, but I am not a shoemaker. There is a number printed inside the shoes, it’s 1725..